Taking to the skies isn’t something only animals with wings (or planes) can do. Sure, birds, bats, pterosaurs and insects mastered sustained powered flight, but lots of other creatures can also get some serious air time by gliding, parachuting, or using other methods. You’ve probably heard of flying fish and flying squirrels, but here are seven other aeronautical animals that might surprise you. Many kinds of spiders use a behavior called “ballooning” or “kiting” to get airborne. They spin fine strands of silk into the air and then ride them up, up and away. Usually, they only travel a few feet, but can go much further—they’ve been found landing on ships in the middle of the open ocean and discovered in air samples collected by atmospheric data balloons. For a long time, scientists thought the spiders were just catching breezes or being carried by thermal currents. A few years ago, though, physicist Peter Gorham showed that electrostatic forces could provide the lift, helping explain how spiders can still take flight when there’s little to no wind. Some frogs aren’t content to simply swim and hop. They go for the whole water, land, and air trifecta by using webbing between their toes and flaps of skin on their limbs to parachute—and in some cases glide—through the air after a leap off a branch. There are “flying frogs” in a few genera, but the most well known are the rhacophorids like Wallace's flying frog and the Malabar gliding frog. These species spend most of their time in trees and glide to quickly move to the ponds they use for breeding. The ancient Mesoamericans had a deity called Quetzalcoatl, the “feathered serpent.” On the other side of the world, there’s a real snake—actually, a few of them—that fly, no feathers needed. The five snakes in the genus Chrysopelia, found throughout Southeast Asia, can all glide for a good 300 feet after dropping from tree branches. (You can see one, the Sri Lankan flying snake, in the top image.) Their trick is that they flatten their bodies out, doubling their width and changing their shape from a rough circle to a concave, frisbee-like form. 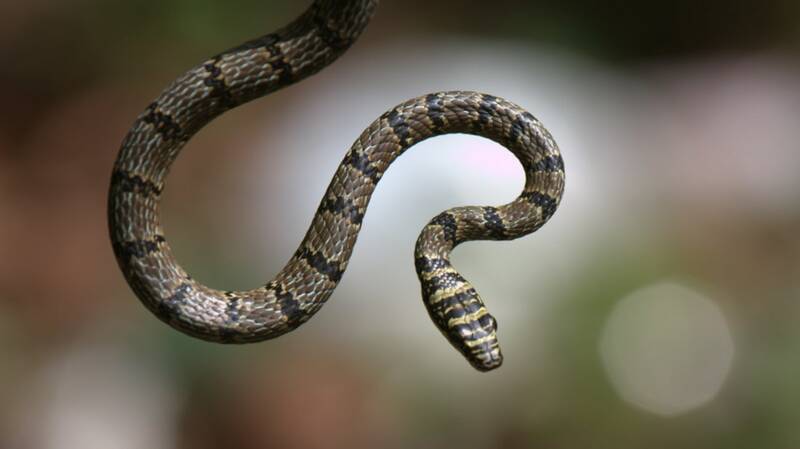 Once they’re in the air, the snakes twist their bodies into an S shape and wiggle side to side, basically slithering mid-air, to control their flight. Colugos are sometimes called flying lemurs, but that’s a misnomer on two counts. First, they’re not lemurs—these mammals are the sole members of the order Dermoptera, which split off from the primates tens of millions of years ago. Second, they don’t fly, but glide. They do that pretty well, thanks to thin, lightweight bones and an expansive membrane that runs from shoulder to front paw to back paw to tail on both sides of their body. They’re considered the most skilled gliders among mammals and can even take on passengers: Mother colugos regularly glide from tree to tree, covering distances of a few hundred feet, with their babies clinging to their bellies. Some ants fly using wings, but even some of those without them aren’t earthbound. There are gliding ants in several genera, but the first known to scientists was Cephalotes atratus, sometimes called the turtle ant. In 2005, ecologist Stephen Yanoviak was climbing a tree in the Peruvian rainforest to study mosquitoes and brushed away a few of these ants that were bothering him. They kept coming back, though, and Yanoviak soon figured out that they were using a “directed aerial descent” to return to the tree they were knocked from and climb back to where they started. After falling a few meters, the ants stretch their wide legs and head out to catch air like a parachute and slow themselves down, then glide while twisting around to reorient themselves before grabbing onto a tree trunk. Flying squid are odd aeronauts. Unlike the other critters on this list, their flights are powered, but unlike like birds and bats, the power doesn’t come from flapping wings. Instead, flying squid (Todarodes pacificus) draw water into their mantles (the part of the body behind the head) and then shoot it out in a powerful jet that can launch them out of the water and around 100 feet through the air, where their fins and tentacles provide stability. For a while, even scientists didn’t realize this extinct reptile, which lived roughly 260 million years ago, could glide. When the first specimen was discovered, researchers found several long rod-like bones near the rib cage and assumed they were pieces of fish fins that gotten mixed in with the skeleton. Other scientists later figured out that the bones actually belonged to Coelurosauravus, but weren’t part of its internal skeleton. Instead, they were osteoderms, bony deposits that develop in the skin. In most animals, osteoderms form scales or plates, but in Coelurosauravus, they made something more like a wing and supported a membrane of skin that allowed it to glide.